Endurance Solar and Engineering is offering a $500 discount towards an Endurance Photovoltaic system to individuals that hear about this offer through DENC. Endurance Solar uses extra durable, stress and weather resistant solar power technology to bring its customers quality and rugged products. Run your home and EV on the power of the sun! Call or email Dan to set up a free home evaluation. 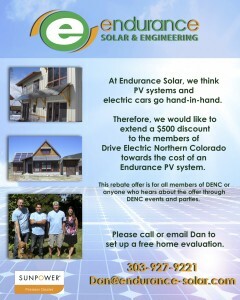 Visit Endurance-Solar.com for more information.